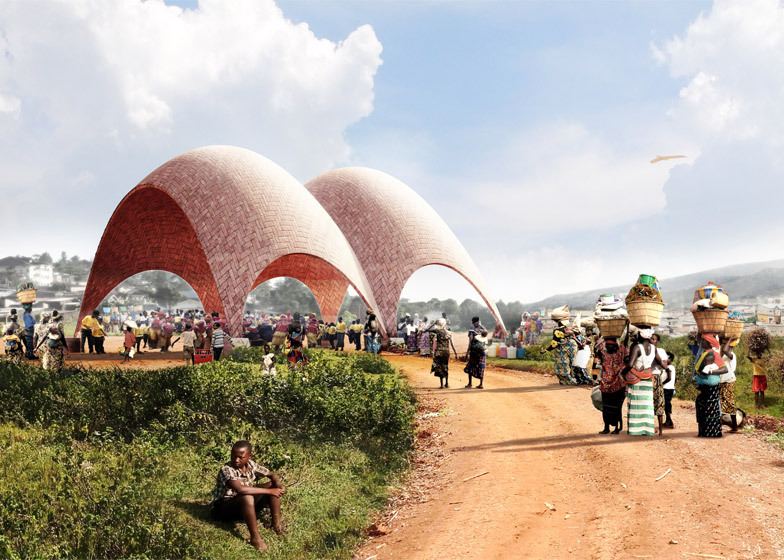 Foster + Partners has unveiled designs for a drone port in Rwanda, which will be used to transport urgent medical supplies to remote parts of the East African country via unmanned flying vehicles (+ slideshow). 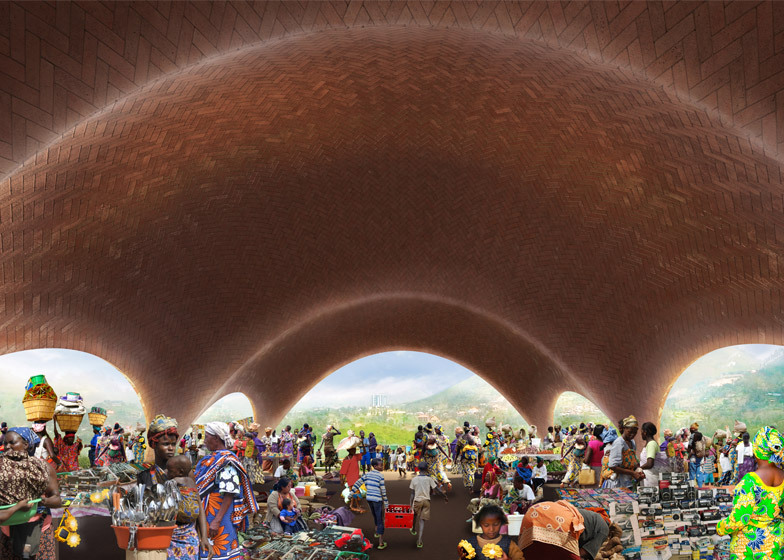 Foster + Partners are working with technology company Afrotech on the Droneport project, which will see its pilot scheme completed in Rwanda by 2020. The project aims to offer an "affordable alternative that can complement road-based deliveries" of medical equipment within the mountainous country by using drones. Although drones are already widely used for filming and surveillance, designers and companies have been exploring ways to use them for delivery services and medical aid. A TU Delft graduate developed an unmanned aerial vehicle with built-in defibrillation equipment that could fly to a patient suffering from a heart attack in a fraction of the time it would take an ambulance to drive. Both Amazon and Google have been testing drone delivery systems. 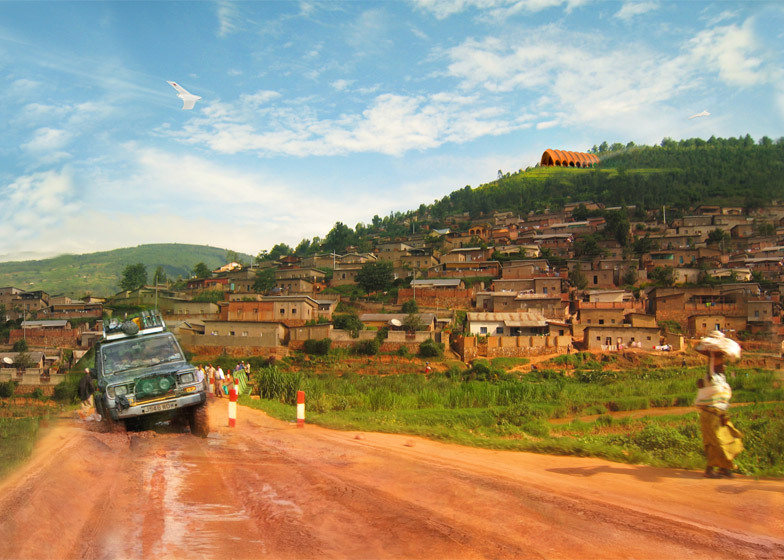 It is estimated that just one third of Africa's population live within a mile of an all-season road, making it difficult to transport medical supplies to remote parts of the continent. With the current infrastructure unable to expand quickly enough to deal with Africa's growing population – set to double to 2.2 billion by 2050 – Foster + Partners said there must be an "infrastructural leap." 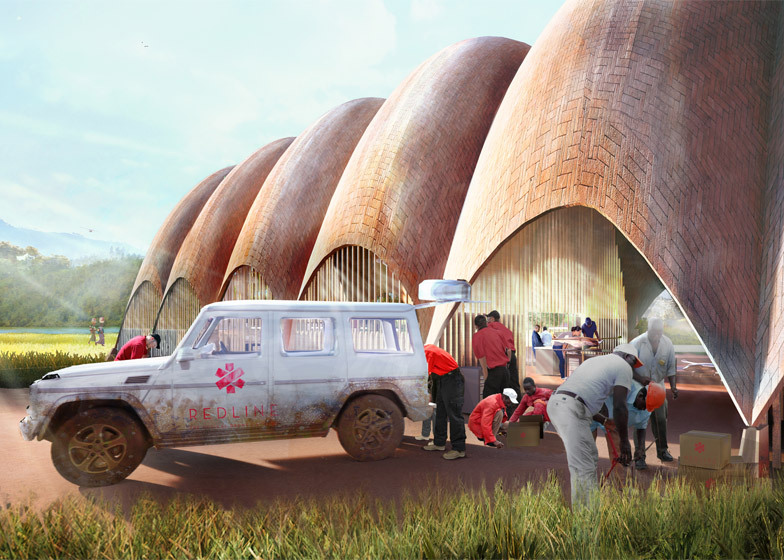 The Droneport will operate two parallel networks: the Redline using smaller drones to deliver medical and emergency supplies weighing up to 10 kilograms and a commercial network called the Blueline transporting equipment, electronics and e-commerce items weighing up to 100 kilograms. "Africa is a continent where the gap between the population and infrastructural growth is increasing exponentially," said Norman Foster. "The dearth of terrestrial infrastructure has a direct impact on the ability to deliver life-giving supplies, indeed where something as basic as blood is not always available for timely treatment." "We require immediate bold, radical solutions to address this issue," he added. 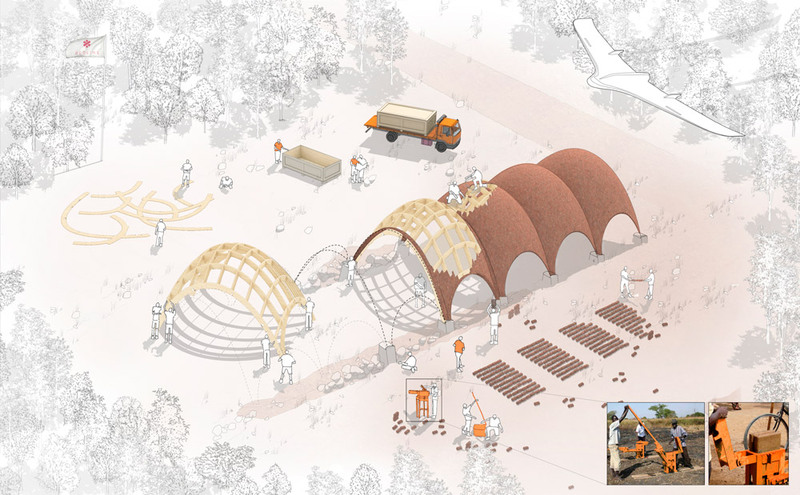 "The Droneport project is about doing more with less, capitalising on the recent advancements in drone technology – something that is usually associated with war and hostilities – to make an immediate life-saving impact in Africa." 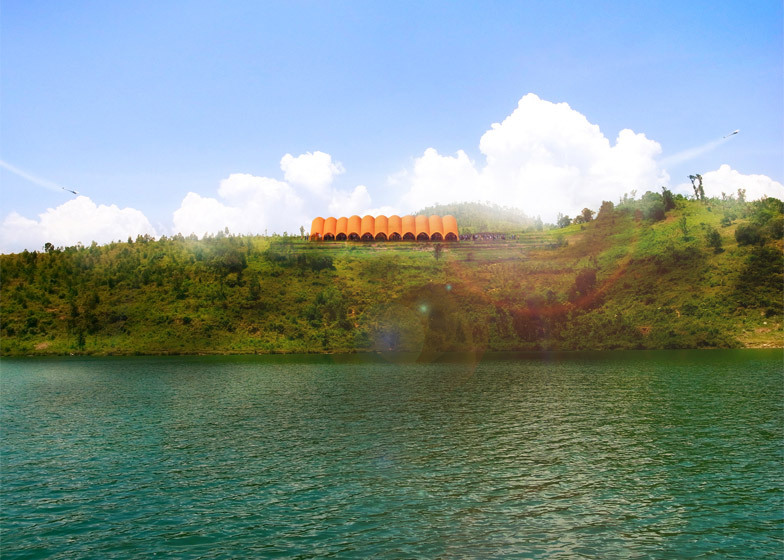 Work is set to begin on the Rwandan scheme in 2016 and complete by 2020. 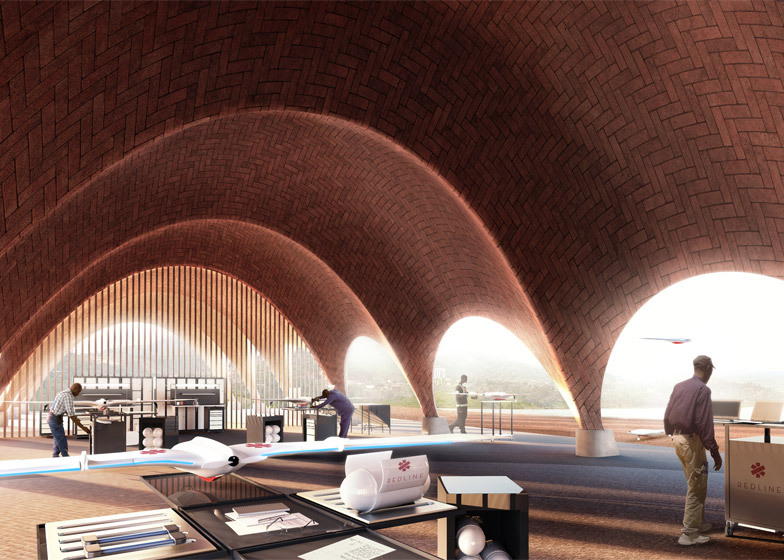 The Droneport will take the form of a row of vaulted brick structures and will host a medical centre, post and courier rooms as well as an e-commerce trading hub and a drone manufacturer. It is estimated that drones flying from the port will be able to cover 44 per cent of Rwanda. The firm sees the potential for drone ports to become as commonplace as petrol stations and there are plans to expand the scheme across Rwanda and into neighbouring countries such as the Democratic Republic of Congo. 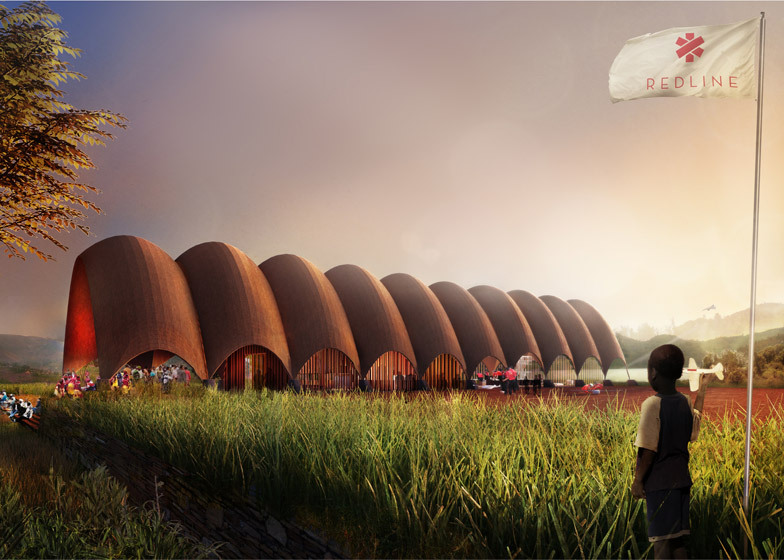 "The Droneport offers a new typology for a building which we hope will grow into a ubiquitous presence, much like petrol stations have become dispersed infrastructure for road traffic," said the architects. The Droneport project follows Foster's airport schemes in Mexico City, Jordan and Beijing, as well as recently unveiled plans to develop charing station for electric vehicles with Nissan. Earlier this month we featured a drone video showing the firm's Apple Campus 2 rising out of its Silicon Valley site, while at the beginning of the year Norman Foster narrated a drone tour of his Hearst Tower in New York.